How to Read Literature Like a Professor: A Lively and Entertaining Guide to Reading Between the Lines, Thomas C. Foster, 2003, Harper Perennial, ISBN 9780060009427, 314pp. A better subtitle to this book might be “Understanding Symbology,” but then you would miss the “lively” and “entertaining” part of the current subtitle, and that shouldn’t be thrown away. 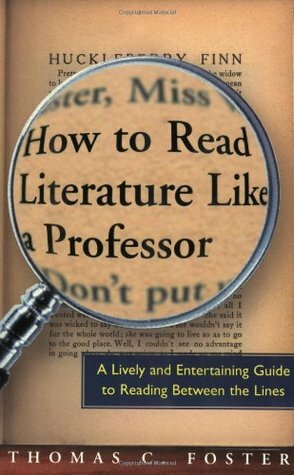 This is probably the best book I’ve ever read about the ugly task of decoding literature, and I would highly recommend it as a graduation present for any high school student who plans to attend college. It’s that good. Foster is no dry academic, although his taste still runs to the rather mundane type of literature that doesn’t do anything for me personally. What Foster is good about, though, is explaining exactly why he finds that type of literature exciting and how one can decipher it to understand what those darn professors find interesting about it, too. This is a nice companion piece to Jane Smiley’s Thirteen Ways of Looking at the Novel, especially her chapter on how novelists play games when writing. Smiley comes to the novel as a practioner; Foster looks at the novel as a cartographer. Smiley explains how to play the game, while Foster shows how to understand what the game was that the novelist was playing. Do all novelists play games? No, only the better ones. It’s not that novels that have nothing going for them beyond the plot are bad per se, but like a movie that goes from one chase sequence to showdown, a plot-only novel is one-dimensional. The only thing missing in Foster’s explication here is an understanding for novels of ideas, which often get short shrift from the academy, sometimes rightly (when the novel has no plot or characters and only presents the ideas) but often overlooked because the novelist eschews symbology for prognostication. It’s only a slight misstep, and one easily forgiven for most college classes where this book will come in handy won’t be covering those kinds of books anyway.